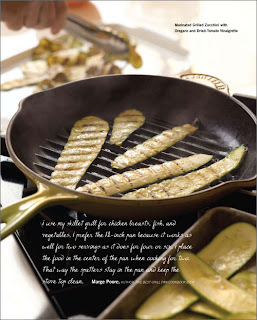 The grill pan, also called a skillet grill, comes in all sizes and shapes (round, square, and rectangular) and is made from a variety of materials, such as steel and aluminum blends, or cast iron. Designed for use on the stove top, it has raised grids that leave seared grill marks on the surface of the food, making it possible to pretend you’re grilling even when it is snowing outdoors. The wells between the grids catch fat and juices, leaving the surface of the food dry—a boon for anyone interesting in low-fat cooking. Before adding the food to the grill pan, preheat it over medium heat for about 2 minutes, or until a drop of water sizzles and evaporates on contact. Oil the grill pan or the food, just as you would when using an outdoor grill. The grill pan is perfect for quickly heating up hot dogs or fully cooked sausages, and great for grilled sandwiches, thin cutlets, chicken breasts, and vegetables. Food cooks more slowly on a grill pan than it does on a flat surface, because contact with the food is limited to the grids. Hamburgers are only successful on a grill pan if the patties are less than ½ inch thick. This is true of most meats cooked on the grill pan. Vegetables cook best when they are thinly cut, so all surfaces will come in contact with the hot grid. Never scour a grill pan with abrasive cleaners. Instead, soak the pan in warm, soapy water, loosen cooked-on particles with a stiff brush, rinse, and dry. Before storing a washed grill pan, rub all of its surfaces with flavorless cooking oil until they are dry, with no trace of oil remaining. Always consult the manufacturer’s instructions. A panini grill can be substituted for a grill pan.